Adblock Pro is very popular ad-blocking extension for the Google Chrome browser with over 2.7 million users and 12500 mostly positive ratings on the Google Chrome Web Store. If you install the extension and have used uBlock Origin before, you will immediately notice that it uses more or less the same interface as the popular extension. The core difference is the Adblock Pro logo that is added to the menu when you click on the icon in Chrome’s address bar, and the logo on the settings page. If you dig deeper, you will notice that the about page is missing, but that all other interface elements are a one to one copy of uBlock Origin. Raymond Hill, creator of uBlock Origin, left a review for Adblock Pro on the Google Chrome web store that highlighted this, and other interesting tidbits. I am the developer of uBlock Origin. Also, aside google-analytics.com, whoever is behind this extension added another Content Security Policy directive which should really not be needed (the ability to embed Flash objects in the extension code itself). I consider this suspicious. Also, the maintainer of Adblock Pro apparently does not want users to find out that the code was taken from the uBlock Origin project, the “About” pane has been removed from the dashboard. Just use the real uBlock Origin: you get a more up to date version (1.10.0 as of writing), without any analytic hooks in the code base. If you compare the source code of both extensions, you will immediately notice that they share most of the code. 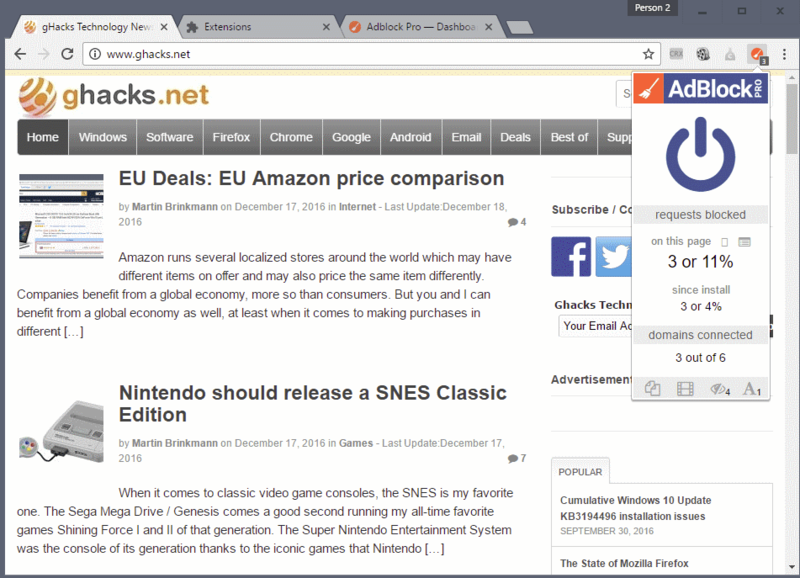 The main difference is that Adblock Pro seems to use an older version of uBlock Origin than the original. What more, the about page is still in the code of Adblock Pro, but it is not linked. It highlights that the extension is indeed uBlock Origin based. So, no attribution at all by the makers of Adblock Pro. What weights more are Raymond’s other findings. First, that Google Analytics code was added to Adblock Pro. This means that some level of logging is going on, and available on Google Analytics. Raymond noticed that code was inserted into the Adblock Pro extension to “embed Flash objects” in the code itself which he called suspicious. It may not be that surprising that a rip-off of a popular extension can gain lots of popularity. More than 2.7 million users compared to Ublock Origin’s 6.9 million is quite the feat considering that it does not add anything original and is based on an older version of uBlock Origin. As Raymond noted, there is no reason to use Adblock Pro at this point in time. Considering that it uses old code, has analytics integrated and the option to run Flash content, it is fair to say that using uBlock Origin is the much safer bet.